It is such an amazing feeling, to face the end of finals and look forward to my first holiday season (bar an academic paper up for submission) in two long years. After doing some mental math, I realized that I have been working without respite for the past two years. Some may argue that I took a break last summer also but then, I would beg to differ. Carrying a live person in the stomach for nine odd months and popping one fine day in summer is not my idea for a vacay (plying the mom card here). And that’s exactly what I did last summer. Although this year is going to be as tricky as last year, I am taking solace in the fact that I would not be learning something as challenging as being a mother and breastfeeding an ever hungry baby. Yep, I am up-to-date with all of Miss Kohlrabi’s tricks. Nothing, I repeat, nothing will frazzle me. But I really do hope she gives me an easy time, mommy deserves a holiday. So I have all the time until mid-August until my next (crazy) semester commences and I have all the time in the world until the last week of June to plan a party (Kohl’s first), pack for the India trip and wonder how we are going to manage this then-one year old in a confined space for 24hrs. I guess I will come to that later. So until then, I have quite some time and I have planned to do a whole list of stuff while the baby will be away, having a great time at the daycare for three days in a week. It is cleaning time! Everything starting from the refrigerator to the door knobs are scheduled to get deep-cleaned, thanks to a huge bottle of hydrogen peroxide, a big bag of baking soda and Costco-size dish liquid. Yes, I am channeling all my energy into the 1050 sq.ft. that is the house. I also have plans to cook wholesome, healthy meals, which would be balanced by those unhealthy ones at good intervals. So before I go and revel in all the awesomeness that is the end of this academic year, let me tell you what I made recently. I cannot call it a falafel since it doesn’t involve frying and mixing in egg into the batter. 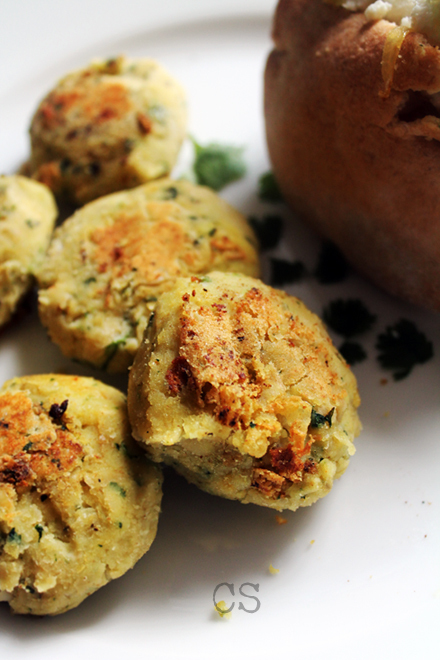 But it is loosely based on this Mediterranean chickpea ball. Okay, I know that this is the second chickpea recipe in a row. Since pulses, beans and lentils are the primary source of protein in a vegetarian diet, we use all of the above quite frequently. 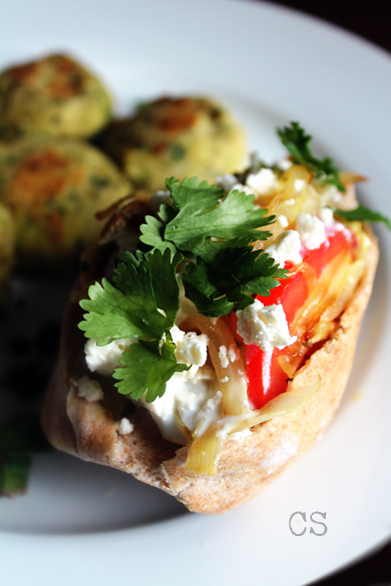 This recipe is also a super-loose interpretation of Zoe’s Kitchen’s Greek Chicken Pita. Although I don’t eat meat, I know what goes into this sandwich and I just subbed the chicken part with my toasted falafel. I didn’t see anyone complaining! Coarsely blend all the ingredients, except for the oil, together. Add enough water to make a dough-like consistency. Shape into balls (I was able to make 12). Heat a pan. Pour enough oil to grease it lightly. Flatten the falafel balls. Working in batches, toast them until golden brown on both sides (it took me four minutes for each side on a medium flame). Set aside. Caramelize the onions with a pinch of salt on low flame. Blend the Greek yogurt, cucumber, dill, garlic, salt and pepper with a fork to make Tzatziki. Cut the Pita pockets into half and loosen the flaps. Fill it with a leaf of lettuce. Put in a couple of falafels. Gently press the sides of the pita to crush it. Add the tomatoes and top with some caramelized onions. Drizzle with the Tzatziki and a tsp of Feta cheese. It might sound like a complicated sandwich to make but burgers require the same number of steps. And exactly like a meaty burger, this Pita sandwich is so worth the trouble! Categories: Food, Gradschool, Healthy, Recipe, Salad, Sandwich, Sandwich, Snack | Tags: academics, break, caramelized onion, cleaning, cucumber, falafel, feta, finals, fresh food, garbanzo, holidays, kohlrabi, med-inspired, paper, pita, sandwich, to-do, tzatziki, zoe's kitchen | Permalink.